The Ford Super Duty pickups offer a pair of stout engines and can tow bumper-pull trailers that weigh up to 19,000 pounds or 31,200 with a fifth-wheel setup. Their bold, broad exteriors are backed up by cabs that are attractive, functional and comfortable. Platinum and King Ranch models are downright luxurious. 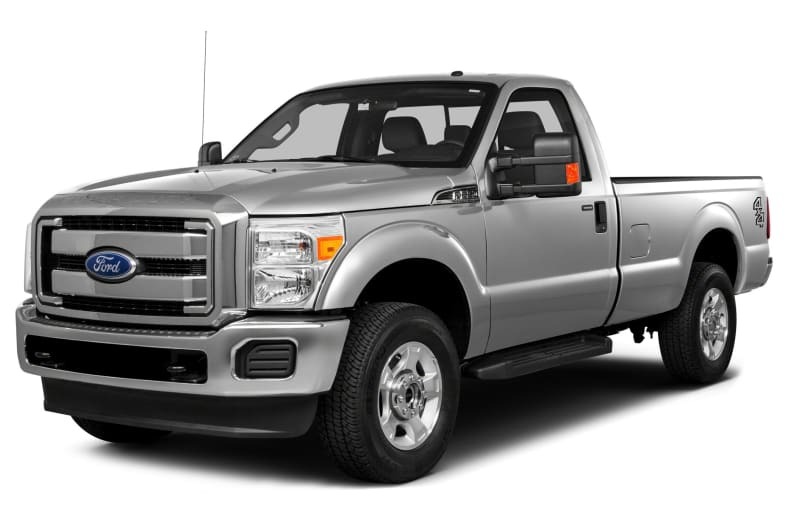 The F-450 pickup that shares Crew Cab bodywork with the F-350 remains atop the tow ratings for Ford pickups, while an F-350 regular cab carries the most (payload up to 7260 pounds). Changes for the 2015 Ford Super Duty are primarily to the uprated diesel engine option and the F-450 returning to a more commercial-grade chassis and running gear. The current-generation Super Duty was introduced for the 2008 model year and last revised for 2011. The 6.2-liter V8 gasoline engine that comes standard is rated at 316 hp in most versions and 385 hp in trucks less than 10,000 pounds GVWR (a few F-250 and single-rear wheel F-350 models). GM's 6-liter claims 360 hp across the line, and Ram's 5.7-liter and 6.4-liter Hemi V8s cover 370-410 horsepower. Ford's 6.2-liter, like GM's 6.0 and Ram's 5.7 may be converted for CNG or LPG operation, which typically results in lower power output. The 6.7-liter Power Stroke turbodiesel V8 is rated at 440 hp and 860 lb-ft of torque (GM's 6.6-liter is 397 hp, 765 lb-ft, Ram's 6.7-liter is 350-385 hp, 660-850 lb-ft). Both Super Duty engines come with a 6-speed automatic transmission; no manual is offered. Most models offer a choice of rear-wheel drive or four-wheel drive but F-450 is 4WD only. There is nothing small about a Super Duty: the shortest, plainest version represents three tons of mass, the largest nearly 4 3/4 tons. While the snout is mildly curved and the airdam lower, the Super Duty is about as sleek as the building blocks they haul, with in-your-face attitude and enough chrome to allow a man to shave in front of it, a handy camping bonus. Super Duty trim ranges from basic commercial grade to luxurious King Ranch and Platinum models. Buyers can revel in heated-and-cooled leather seats with driver memory, moonroof, SYNC voice-activated communications and entertainment, navigation, and remote start. The 6.7-liter diesel is quiet compared to those of a few years ago. Super Duty XL and XLT are designed for the cost/benefit analysis small businesses and independents use: a simple, fast trailer hookup, 4WD to get in/out of the job site, and a warm cab they can blow clean with compressed air. For fleet and owner-operator buyers, Ford's Work Solutions system provides facilities for GPS linking, computer access to your office (with cell signal), 110-volt power in-cab, and RFID tags for your tools so you never leave any on the job site. Crew Chief allows a dispatcher real-time truck location, speed, and fuel economy, potentially useful for the weekend-night parent as well.